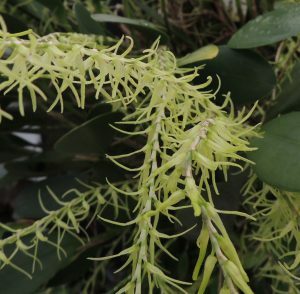 This is one of our favourite pleurothallis species and it is looking just amazing this morning. 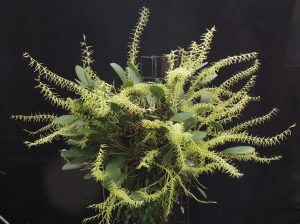 It comes from Brazil and produces a dramatic display when its long spike of spidery flowers in such profusion that they hide the leaves of the plant. 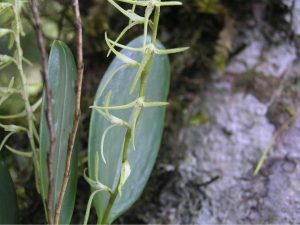 We have seen the species flowering in Brazil where we found it growing abundantly of mountain ridges at around 1200m in cloud forest. 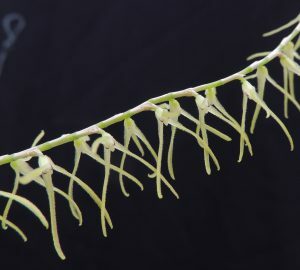 This photograph of the species near Macae de Cima shows a plant growing in the trunk of a tree in moist forest with a fair amount of moss on most trees and additional humidity coming from the large amount of bromeliads present in the habitat. The photo shows old spikes as well as new and the habit of flowering for many years from the same leaf axil explains the dramatic flowering display give by mature plants like our one in the school greenhouse. Cool Americas gives a close match with the native habitat – cool (min 12C) , moist, and shaded. We find the species does very well mounted.